Dev tracker is still useless as it is organized based on threads rather than actual replies, this means specific posts are obfuscated behind non-dev posts. This is really the only big problem I see with the new forums. I like the changes but I do have a question, is there a reason why you didn't create a QOL subforum when you created these forums? The design looks amazing IMO! I saw things got darker and thought something on my computer went wrong, lol, but glad it was something of an improvement for here! Yes, there's a reason. At one point, we had more than 40 subforums. More than 40!! It was too many, and the conversations were too spread out -- thus reducing the volume of input and interaction -- or they were repeated (inadvertently) in multiple forums, or people were never sure where to place a question, comment, or suggestion. I streamlined down by 1/3 when I accepted the Communications Manager / Forums Team Lead position in 2014. I streamlined further when we opened these new forums. And some members of higher management believe we should try to have even fewer forums! Adding a QoL subforum isn't necessary, and it's not even practical, when a QoL request might apply to a specific profession/skill balance, to an in-game mechanic, or to any number of other topics. So please feel free to share your QoL suggestions where they best fit, and rest assured that they will be seen. Dev Tracker is a major disappointment for me, too. It's not at all what we intended, but we're not able to make changes. Perhaps in the future we'll be able to develop a system that best addresses our needs, and I do remain hopeful about that. In the meantime, or until such time as we can make the improvements, we expanded the Latest Posts rotating section at the top from 6 dev posts to 12, and I think you'll find it's quite helpful in locating recent posts. Checking on that Thumbs Up etc color change -- looks like it globally changes. Which may be intended of course! But as it is, right now it will just let you know that at least one reader has clicked a reaction, not whether or not you personally have. Editing a post seems a bit sluggish. Took a few tries to edit something I just posted. I was able to after about a minute. But right after I realized I needed to edit a second time. I clicked and clicked and nothing happened. I waited a few minutes and it finally worked. Not sure if that's intended or not. Other than that, I love the new changes. Edit: Same thing here. Immediately after posting this I noticed a typo. Took a minute before it would let me edit this post. "Edit Post" function is borked, can confirm. I've been unable to edit my posts since the update (PC, Chrome). Also, would dearly love to have the "Mute" function again. The "Discussion" tab is nigh unusable without it, as it simply gets clogged up by posts I have no interest in (PvP, WvW, Bug Report, etc.). Marking forums and sub-forums as "Read" is also a tedious slog, as there is no way to do it from the (sub)forum itself; instead, I currently have to go to the main page, scroll down, click the gear icon, "Mark as Read," wait for the page to reload, scroll down again, repeat the steps for the sub-forums. There just needs to be a "Mark Forum As Read" function at the top (and bottom) of each forum, like any sensible VB4 forum from the 90s. I've found that the 'Edit' button seems to have changed its active area, and only lights up when I place my cursor to the left side or right side of it. Placing the cursor over 'd, i, or t' won't activate it (light it up). Something is odd about it now. I don't the way it looks. I opened discussions, i wanted to check new topics, but my sight was locked on these huge avatars. 2/3 of my screen is covered with avatar images and nicknames. Look at the distance between "Started By" and "Replies" or "Most Recent" and option and bookmarks icons. If i were looking for some players with particular avatars - it would work, but since i come here to read information, well, it's poor design for this. -"I've found that the 'Edit' button seems to have changed its active area, and only lights up when I place my cursor to the left side or right side of it. Placing the cursor over..."
And eventually at far right the numbers of views then comments. So people see in one look if the last answer/topic is interesting and so decide to reply or not. In case you've not noticed, some posters are reporting (over in the Bugs sub-forum) the 'Search' function no longer works . I used to read the dev tracker posts every single day on the old forum, that all ended when this forum was introduced. It was fun while it lasted. I guess some things just aren't meant to be. I'm disappointed there still isn't an option of deleting a post I have created. 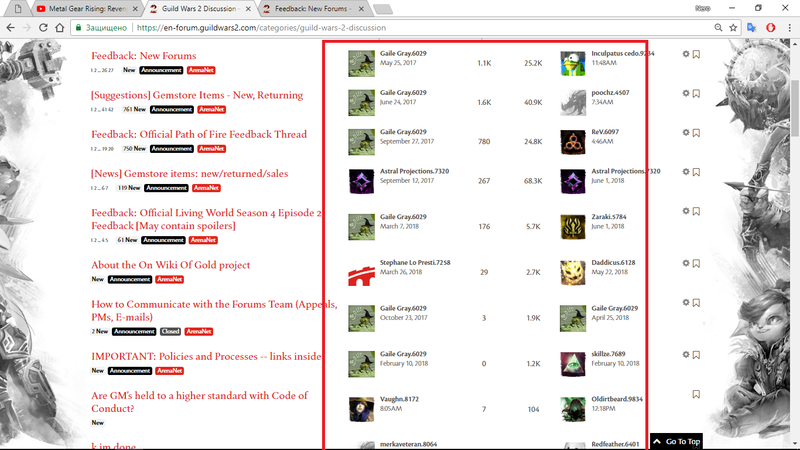 That's what it was on the old GW2 forums, and I am guessing what they had hoped for here as well from Gaile's response. I assume when she says they are "not able to make changes" it has something to do with the company that handles their new forums being intractable about certain things (as they have been about other much requested features at times). Don't place your cursor over the letters d, i, or t while awaiting a fix. Another thing I noticed (not sure if it's always done this, but I've noticed it now) is that when posting in a thread, the 'Report' button is missing on my own posts until the page is refreshed. As you can see in this screenshot, the 'Options' element has a gear icon and the word 'Options' actually written on the page. Though the 'Options' text cannot be seen on the page near the gear icon, it is written in the hover tooltip of it that happens to hang down over the 'dit' in 'Edit', which blocks that area from being able to be clicked. 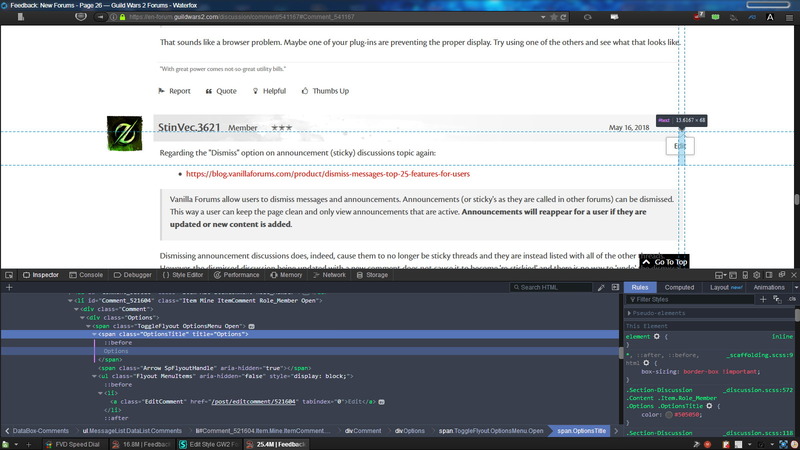 If you use a CSS theme add-on in your browser, this is the code to add to bring the option flyout forward to being on top of the 'Options' element that hangs down over the 'dit' part of 'Edit' so it no longer blocks the activation area. Thank you StinVec. That's very helpful! I have responded to the bug report in the Bugs Subforum about the "edit" borkedness, and I'll repeat hear that we were aware that the "bar" with the names and Edit function wasn't aligned properly and I'm assuming that editing will be corrected when the bar is adjusted, but I'll make sure we have all the notes in hand when we contact Vanilla. I just tested and it appears to be working fine. A forum member also confirmed that they had no problems with "Search." I asked for input from others in that thread about their experience, but this appears to have been a temporary situation and not a long-lasting or systemic bug. Still to be confirmed, of course. But I assume you are reading the Latest Posts in the four-page rotating stream of dev comments at the top of the page? I don't like the "^ Go To Top" pop-up. I have several icons on the notification area of my (windows) taskbar that regularly pop me a notification. The "Go To Top" thing pops up at the exact same location when I have my browser maximized (which is pretty much whenever I use it) and that's confusing and annoying. This new thing is useless to me anyway because I still (and will forever) habitually just press the "Home" key to go to the top of the page. In short: annoying and useless. The other changes like fine though. For me "Home" does not reliably take me to the top of the forum page. Sometimes yes, sometimes no. I'm trying to figure out the difference now. But of course "Page Up" raises placement only incrementally. The "Go to Top" addition was based on user feedback where the consensus indicated such a feature was desirable and would be of value. I do notice it quite boldly myself right now, but I feel certain that its newness is what is making it appear more obvious. I believe that once we're familiar with its form, function, and placement, it will be less noticeable and therefore feel less intrusive. Not to answer for the person who was quoted, but I don't. The main reason why I don't read the "Latest ANet post" is because it doesn't specify which forum got the dev response without clicking on the post. GW2 is a multifaceted game that attracts PvE and PvP players. If the comment is in a section that doesn't pertain to the game mode I play, it's extraneous comments to me. Typically, I'll click on the comment to see what forum it is on. If it's not pertinent to my gameplay, I won't read it. If the "Latest ANet post" showed which forum/sub-forum it is in, I'd greatly appreciate it. I think it would be a QoL update to the forums. I find the 'Go To Top' pop-up annoying, as well. I don't remember a single forum post asking for that feature. Must be in-house only. If it only showed when one moused-over the spot, or something, it might be tolerable to have. No, but occasionally I notice them as I'm browsing, then might take a look, but rarely. The whole format is just so bad, it's more irritating than helpful. Whoops. I meant to use a winking smiley face 'cause I was making a joke, on account the search feature really was broken on the old forums. personally, I don't like the Go To Top addition. I always use the home key, and never really felt the forum needed a button to do the same thing. also, maybe it's because it's such a prominent colour, but it just feels intrusive, like I always tend to look at it. maybe that's just me though. don't like how the thumbs up/helpful buttons work now either. I don't know which ones I've clicked and which I haven't, just that someone did. They never did show that. I'm not happy with the change, and it's not one I requested. I at first believed that the new shift in color revealed that a member had actively reacted, which would be helpful. But from the beginning, you had to click "Thumbs Up" or "Helpful" and watch to count to see if you did or did not react. I don't remember a single forum post asking for that feature. Must be in-house only. As my post was singled out there I shall say that I for one am very pleased with the go-to-top button being added. It might be a slightly clumsy implementation (as compared to, say, adding it to the red text options at bottom left) but it does the job. Now I just need to train my muscle memory to use it rather than scrolling, lol. It's not the feature, it's the pop-up (and that it covers other content, unless you scroll) that's irksome. To reiterate my objection to it: it appears in the exact same spot that some icons in my windows taskbar notification area pop their notifications. From the corner of my eye, I can't spot the difference. And worse, if the "Go To Top" is up, I can miss some alerts because they don't stand out against the black rectangle. I know it didn't show it before, but after the change, it highlighted the issue more to me. does that make sense? it just seems more noticeable now than it did anyway. I think when I saw the change I was hoping for a way to tell if I had clicked it. now it appears bolder, and in my mind that says I've touched it already. I know this isn't your fault, Gaile, and appreciate that you are listening to feedback and are trying to get things improved. The Dev Carousel is so wonky. Why isn't the Patch Notes post listed? Of all the Dev posts, that would be one many are interested in. Oh, I see. It's because they are written the day before, (or more). Too bad the Carousel doesn't go by when they are actually posted, or made visible, because if there are more than a few posts between, they will never show up on the Carousel. I did a quick research but I didn't find any Announcement Thread advertising this aspect so I'm going ahead and create a new one (sorry if it already existed). 1 Star: Req: you get it by simply registering on the forum. Benefits: it allows you to create threads and post in them, you can edit your posts within 4 hours. 2 Stars: Req: if I remember correctly it required a certain time to pass after your first log in. Beneficts: no more time limit for editing your posts. 3 Stars: Req: I don't remember. Benefits: you can now have a signature. 4 Stars: Req: idk. Benefits: idk. I'm editing this as soon as someone clears the missing points. Thanks. I think these new forums are way too cluttered. The old forums was sleek and simple. The text size in these forums are just plain stupid and make it a pain to read any text longer than a paragraph. Everything is just too big and too much. I loved the simplistic design of the old forums. There was a bit too much white space, but this new design is just too much of everything. Did the 'Thumbs Up'/'Helpful', etc. lose its color? Or is it just me? Just you: I still get red on hover, and red on active, for them. I just have the same bug, for me thumbs and helpful are grey now until I hover them and then they turn red ;( that's weird. Glad it's not just me, then. O_o they always were for me, unless they had been activated, in which case they are constant red. Well, it was a new 'feature', that wasn't requested, so maybe it's been turned back off....for some? If we report a post, it should be hidden to us. If the post we reported is the main topic, the entire thread should be hidden to us. Why? That just sounds like wanting a way to block certain posters. Sometimes, reports are only about posting in a less-than-best sub-forum. And, what about when a poster reports their own post or thread? Really should see about fixing the Dev Carousel. I can't think of a worse time for it to be eating all the Dev posts.